Welcome to Jim Dhamer Plumbing & Sewer, Inc.—proudly serving Chicago’s suburbs and surrounding areas for four decades. As a family-owned and operated company, we are fully committed to providing the absolute best in quality and service. Your plumber from Jim Dhamer Plumbing is an experienced technician licensed by the state of Illinois. The contractor’s registration number is 055-008346. Showing nothing but respect for you and your property throughout the entire job, our plumbers are professional, dependable, and backed by our company’s licensed and insured status. 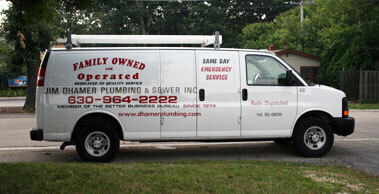 The services you can obtain from Jim Dhamer Plumbing cover a wide variety of plumbing needs and problems. From installation and maintenance to plumbing repair and replacement, we are prepared for any challenge your home or business presents. For more about our services, see Services Available. You can trust our licensed plumbers to perform these services skillfully and efficiently. As a family-owned company, we have a deep commitment to our customers and employees. We hire qualified plumbers to ensure our customers receive the best service available. We are located in Lisle, IL and service all surrounding areas such as Naperville, Aurora, Glen Ellyn and more. Entrust your sewer repairs, clog removals, sump & ejector pumps, water heaters, and other services needed to our expert plumbing contractors. Call Jim Dhamer Plumbing & Sewer Inc. We’ll be glad to serve you! "Very satisfied and grateful for the prompt service for my Mom. I will recommend your company whenever possible." "Plumbers were very polite, quick & nice!" "Plumbers did a phenomenal job & I really appreciated everything." "Thanks for finding & solving my problems so quickly. Great job!" "Just wanted to say thank you to the guys that came to my home to install a new kitchen faucet. John and Anthony came for the installation- they were so professional, got the job done quickly and it looks great. They also provided me with a coupon, and were clearly concerned that I was a happy customer. They took pride in their work and the fact that their company is a professional customer oriented business. Thank you for doing such a great job." "Prompt service from the office staff & terrific job from the plumbers!" "I have had you out for 3 different issues in the last 3 weeks. Once a leaking pipe, a running toilet, and then the major one- the back up of a line. In each case the gentlemen who came to do the work were competent, polite, efficient and got each one of the issues resolved. I am so impressed with their professionalism and good humor and patience about my various issues. Thanks so much." "Every one of your plumbers that have been to my house has been so nice, neat and knowledgeable!" "Terry and Anthony came on short notice and solved my Thanksgiving plumbing issues. Professional, personable experienced technicians." "Thank you for clearing out my pipes so well. I will definitely call back if I need anything else." "I was extremely happy with the hot water heater job. Jim Dhamer Plumbing should be proud of your guys because we are!" Having issues with any aspect of your plumbing? Call us today for a quality fix! Follow this link to find a complete list of the various products we stock. 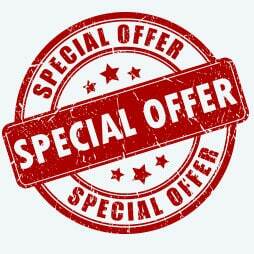 Click here to find coupons that will make starting your project a breeze!